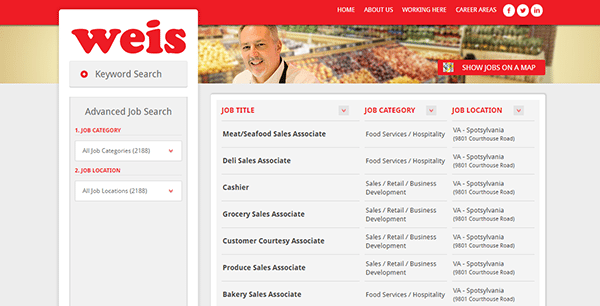 Use the instructions provided on this page to learn how to access the Weis Markets job application (online). Retail (in-store), corporate, and distribution careers can all be applied for on the company’s jobs website. 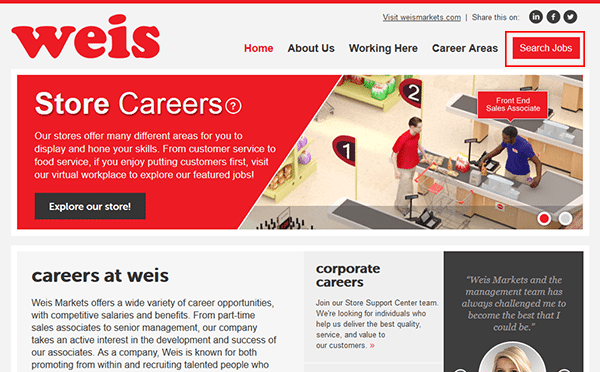 About the Company: Weis Markets is an American supermarket chain headquartered in Sunbury, Pennsylvania. The company operates over 200 stores throughout the Mid-Atlantic United States (specifically in Pennsylvania, Maryland, New York, New Jersey, Delaware, West Virginia, and Virginia). Step 1 – Click this link to open the company’s jobs website in another window/tab. Step 2 – Press the “Search Jobs” button to go to the main search page. Step 3 – Search by job category or location. Step 4 – Hit the job title link of the position you want to apply for. Step 5 – Read the job description and then press the “Apply Now” button to go to the next step. Step 6 – If you already have a profile sign in to it, otherwise click the “Create New Account” button. Are you legally allowed to work in the country? Are you a resident of New Jersey? Step 9 – Agree to the terms, provide your electronic signature, and then press the “Next” button to go to the next step. Step 10 – Provide your cover letter and then complete the diversity section of the form.